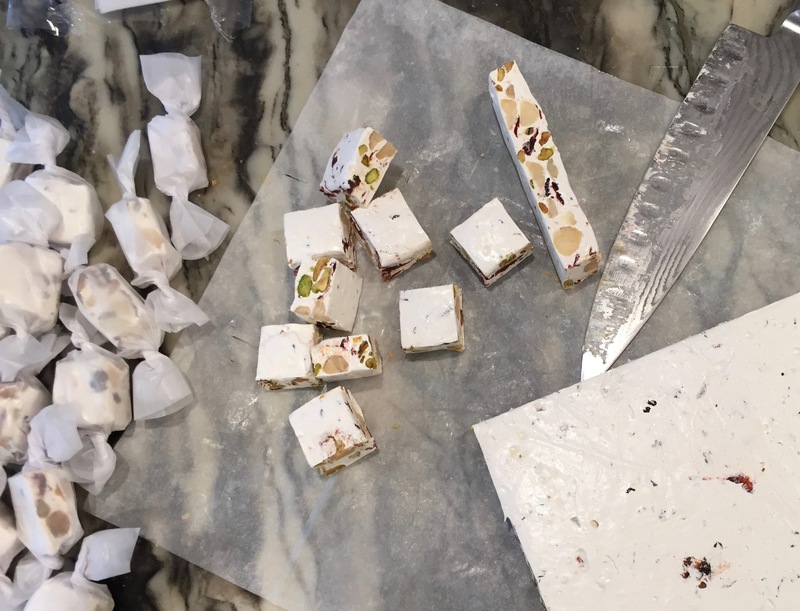 Google what to do with egg whites, dried fruit and nuts, and you get nougat. What they don’t tell you is what an unholy mess it makes. Still, it’s worth it. 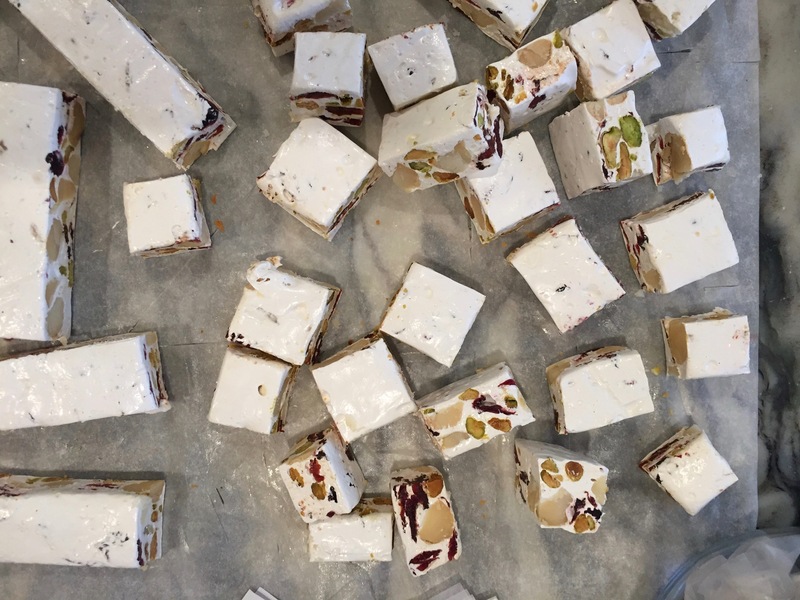 Nougat is a sweet, chewy delicacy I first encountered in Italy, but have seen in France and Spain, and I’ve received gifts of nougat from friends after visits to Northern African countries, Turkey, Iran and Israel. Every country has their own version of this honey sweetened marshmallowy treat stuffed with nuts, always, and fruit, sometimes. Since the holidays ended, I’ve been working through the half bags of this and that, the frozen bits and bobs, all the little leftover whatevers from my holiday cooking and baking. There were macademias and pistachios, dried cranberries and cherries, almonds, pecans, walnuts. The freezer revealed three zip bags, each with three egg whites. Can you relate? 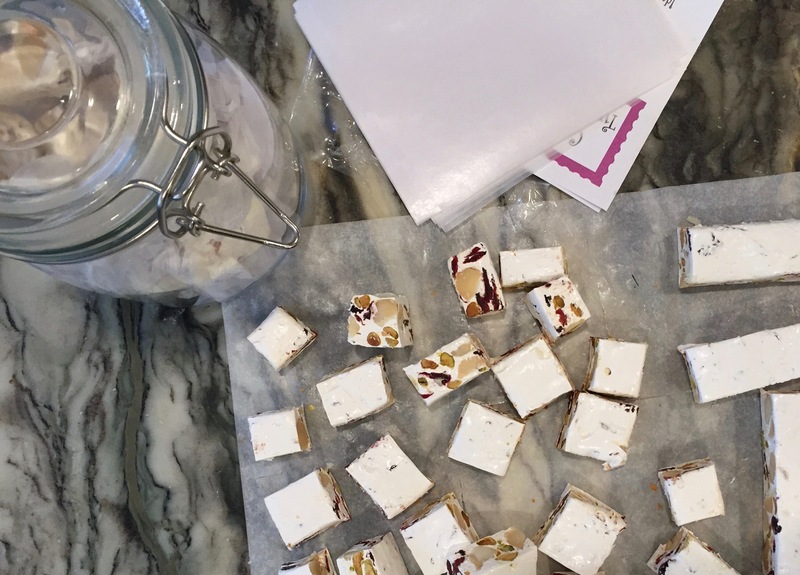 Nougat is dead simple to make as long as you have your trusty thermometer in hand and a stand mixer. I’m sure it is possible to make nougat without the mixer but not easy. Not at all. I read several recipes that called for rice paper to wrap the nougat. I think this would be lovely, but for real life nougat makers, wax wrappers were swell. Wax paper cut into wrappers would work perfectly, but these precuts ones are easy to use and relatively inexpensive. Get everything organized before starting because it comes together one-two-three and then you’ll do the dishes. SorryNotSorry. Gluten free, low in calories, a delicious chewy mouthful of fruit, nuts and honey. Nougat is all that. Valentine’s Day is coming. The snow-zilla days are here. Make candy and tidy up the pantry, all at the same time. 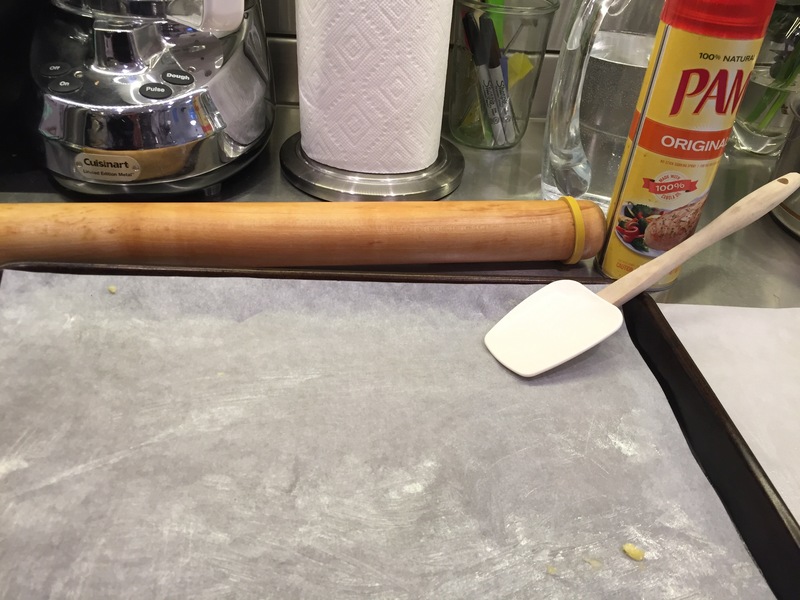 Butter two pieces of parchment paper. Place one in the baking sheet, butter side up, and the other aside. In a deep, heavy saucepan, bring the sugar and 1/2 cup of water to a brisk boil. Brush down the sides of the pan with a brush dipped in cold water. This helps avoid crystals forming which will make the candy grainy. Once the sugar has dissolved and the syrup has reached a boil, clip on a candy thermometer. Without stirring, continue heating the sugar syrup to 298 degrees. This will take about 20 minutes. Watch for hot spots on the bottom of the pot which will burn the sugar. You want a clear hot syrup with no burned or caramel flavor for the nougat to retain its dazzling color. In another saucepan, bring the honey to 258 degrees. It will rise up when it boils, so be careful. In the bowl of the stand mixer, with the whisk attachment, whip the egg whites at medium speed and when frothy, increase the speed to high. Beat until the whites form stiff, shiny peaks. Reduce the speed of the mixer and slowly stream in the sugar syrup and then the honey. Increase the speed to high and whip for 15 to 20 minutes, until the outside of the bowl feels almost cool to the touch. Work to complete the nougat quickly. It’s going to firm up and be contrite. 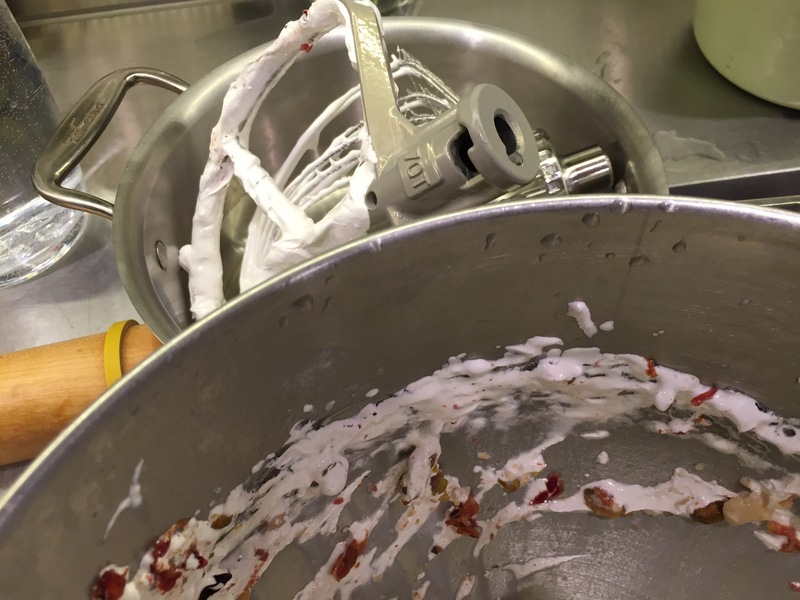 Remove the whisk attachment and add the fruit and nuts to the nougat, folding with a stiff wooden paddle or a silicone spatula sprayed with PAM, until the fruit is incorporated. For this you need a lot of strength and willpower. Scrape the nougat on to the buttered parchment. Place the second paper on top, butter side down, then press the nougat out with a rolling pin and a lot of elbow grease. It’s hard work, this nougat. Survey the dishes. Curse me. I know. It’s one hell of a mess. But all this will melt away with your first taste of nougat, as well as the application of plenty of hot water. Fill the pots you’ve used with water, bring to a boil, and pour it over the impossibly sticky whisk, silicone spatula, and bowl. It’s worth it. I promise. It takes a few hours for the nougat to firm up enough to cut. In some shops, the nougat is sold in long rectangular bricks, to be sliced when eaten. I sliced 2-inch bricks, then sliced across the bricks for bite sized pieces which I wrapped in wax paper. The wrapped candies stayed fresh for a month. Cathy, this is so beautiful. I almost want more snow so I’ll have uninterrupted time to make it! 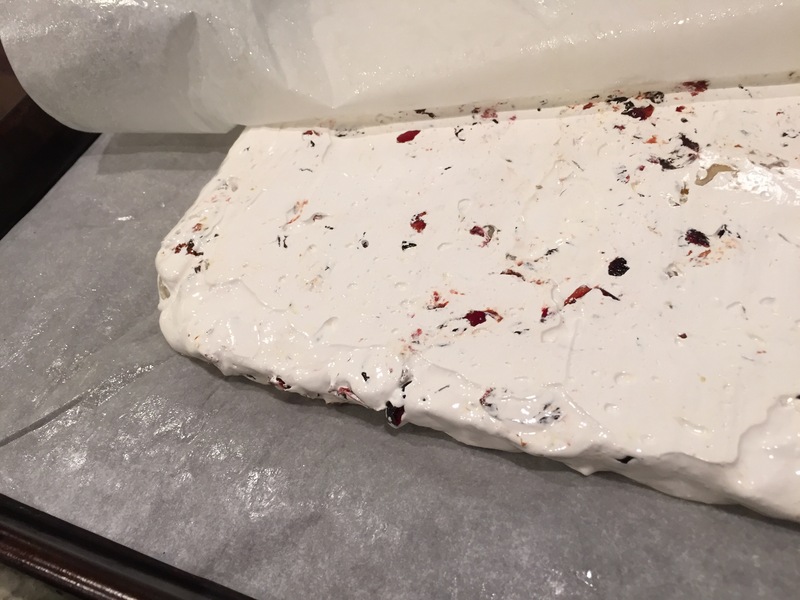 Reading your description of the process, the hard work of mixing in the ingredients, and the cleanup reminds me of making panforte, which was one of the most physically challenging confections I’ve ever made. It was delicious, but somehow I’ve never gotten around to making it again. Have tried (and failed) to make nougat twice so far…this _might_ tempt me to try again.